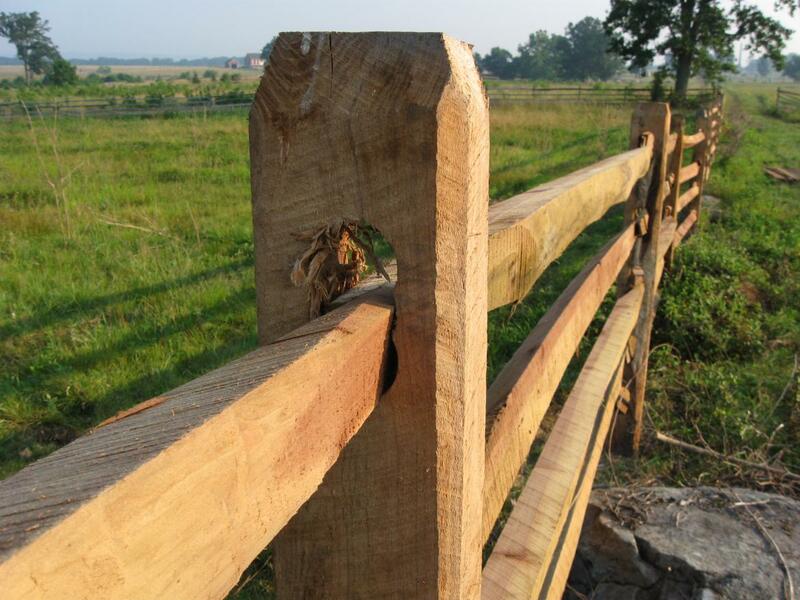 A post and rail fence is being reconstructed along the western slope of Cemetery Ridge. It stretches from United States Avenue to Hancock Avenue. This view was taken facing north at approximately 6:40 AM on Tuesday, July 6, 2010. 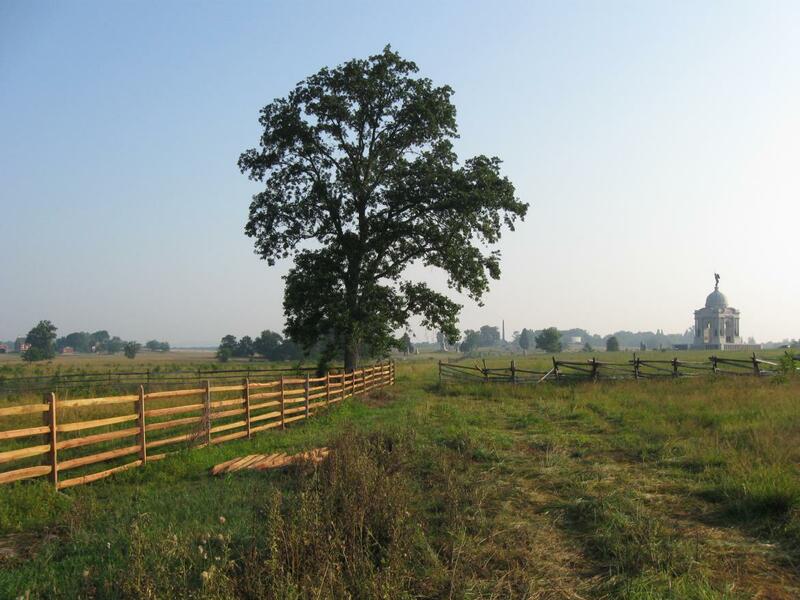 One of the many things that we like about the National Park Service at Gettysburg is its effort to restore the battlefield closer to its 1863 appearance. One of the most visible projects towards that restoration is the rebuilding of the same type of fences that existed on the fields, and in the same locations where they were located before the battle. The fence begins at United States Avenue near the George Weikert House. 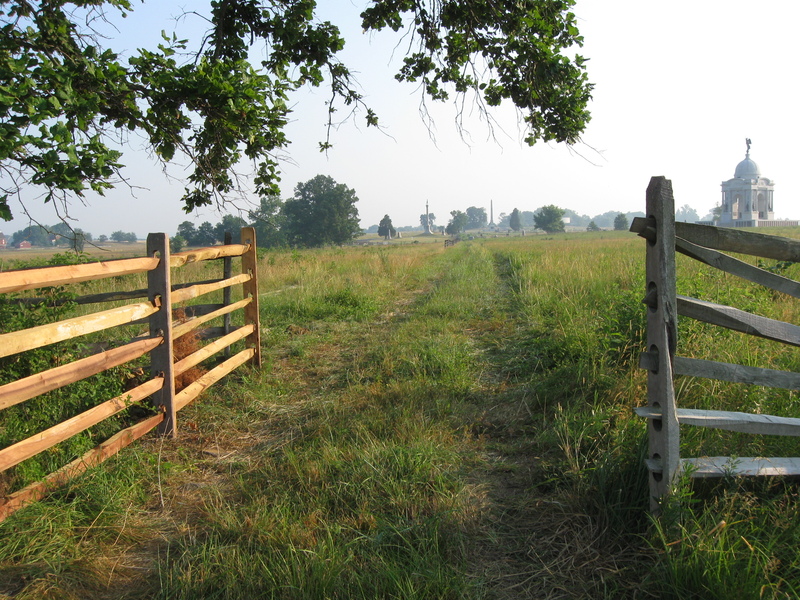 The John Weikert Farm, near the Wheatfield Road, is in the right background. 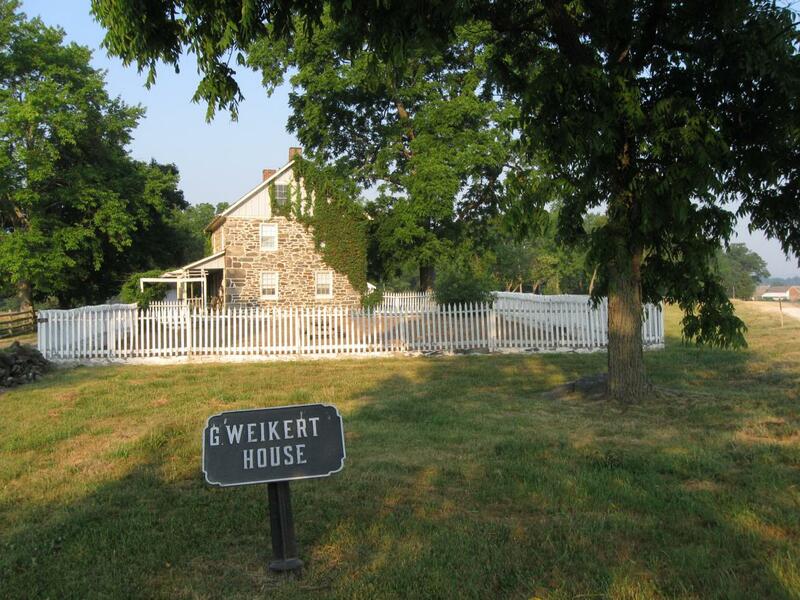 We’ll start a walk down the fence-line beginning at the George Weikert house. This view was taken facing west at approximately 6:40 AM on Tuesday, July 6, 2010. 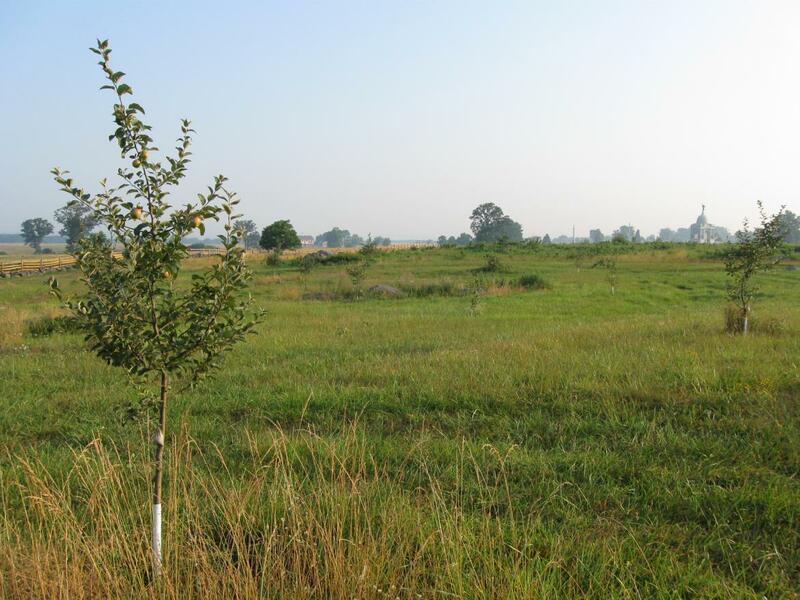 North of the Weikert house across United States Avenue is a small apple orchard. 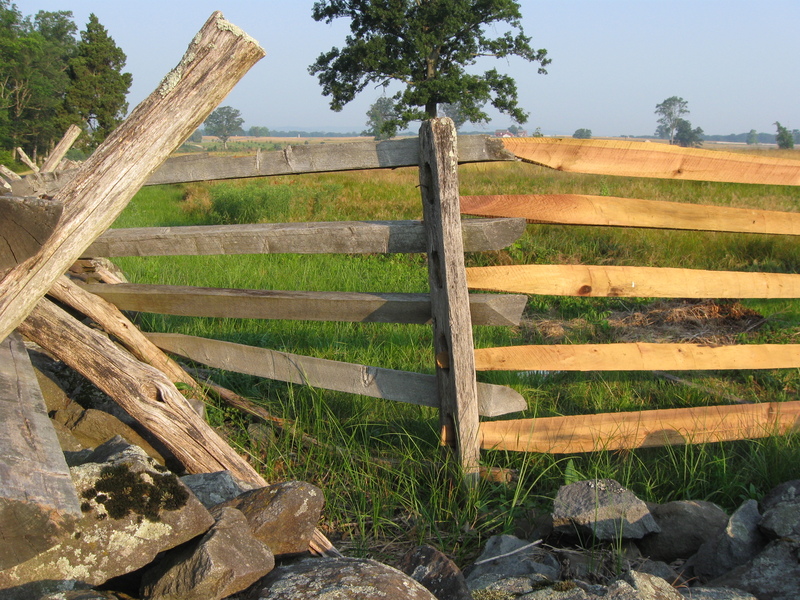 The reconstructed fence is in the left background of this shot. The Pennsylvania monument is in the right background. This view was taken facing north at approximately 6:40 AM on Tuesday, July 6, 2010. 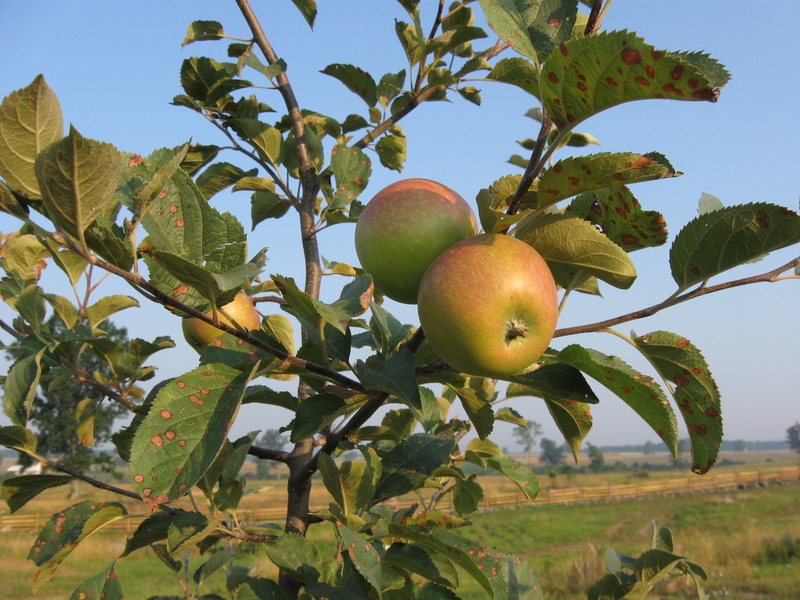 The trees in this orchard have a number of apples on them. The fence is in the background. This view was taken facing northwest at approximately 6:40 AM on Tuesday, July 6, 2010. 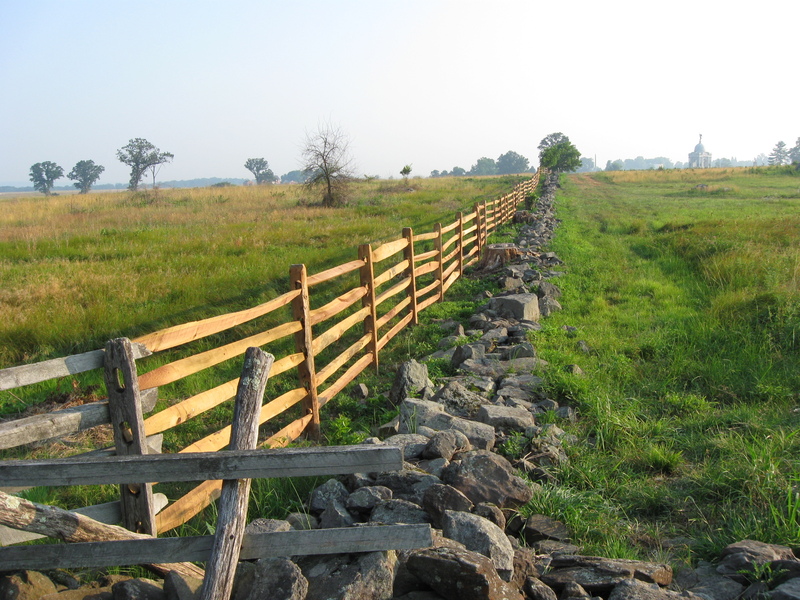 The fence-line runs north to south and follows this rock wall for most of its length. This view was taken facing north at approximately 6:40 AM on Tuesday, July 6, 2010. The new fencing begins here, where the old portion of the fence is still visible. The fence in the left of the view that stretches east to west is a “worm” fence … This view was taken facing west at approximately 6:40 AM on Tuesday, July 6, 2010. 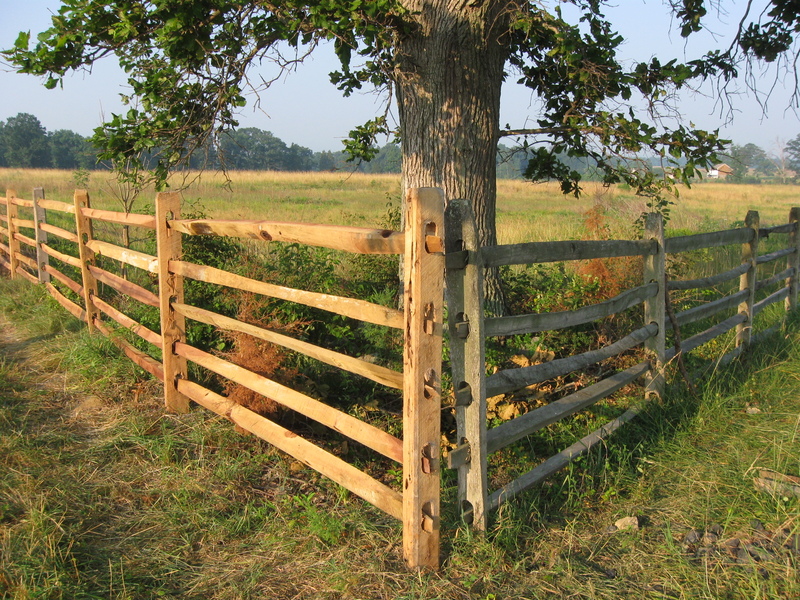 … Whereas this one is a simpler “post and rail” style. This view was taken facing northwest at approximately 6:40 AM on Tuesday, July 6, 2010. 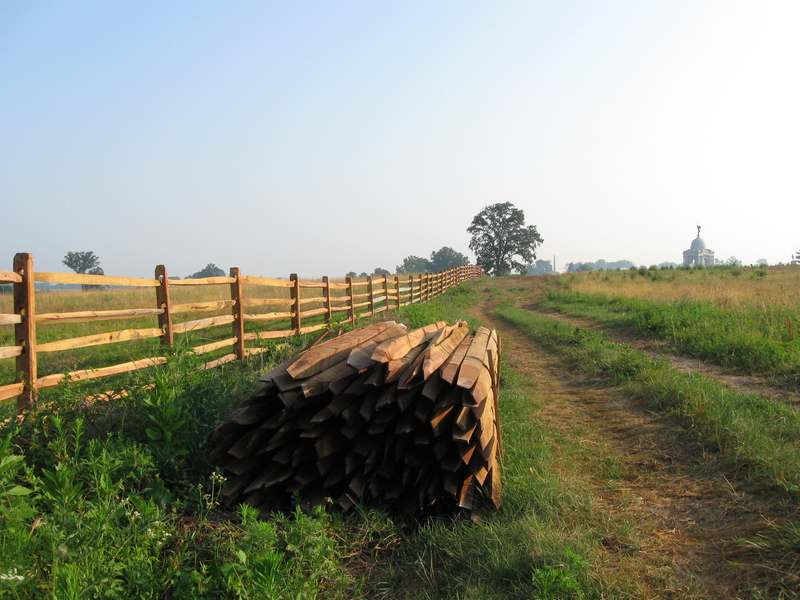 In order to get the fencing material out to this portion of the field, pickup trucks carrying the bundles are used. The marks from those vehicles are visible in this view. This view was taken facing northwest at approximately 6:40 AM on Tuesday, July 6, 2010. 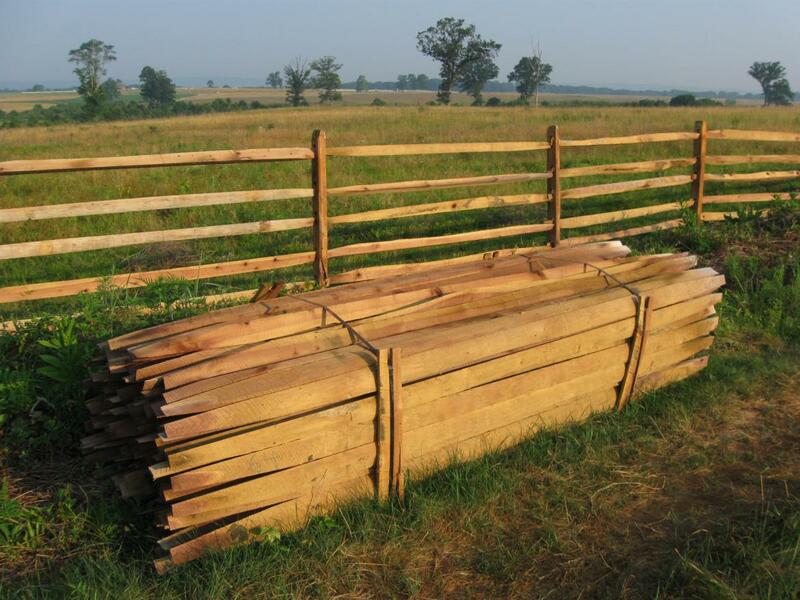 Each bundle contains approximately 100 rails. This view was taken facing west at approximately 6:40 AM on Tuesday, July 6, 2010. 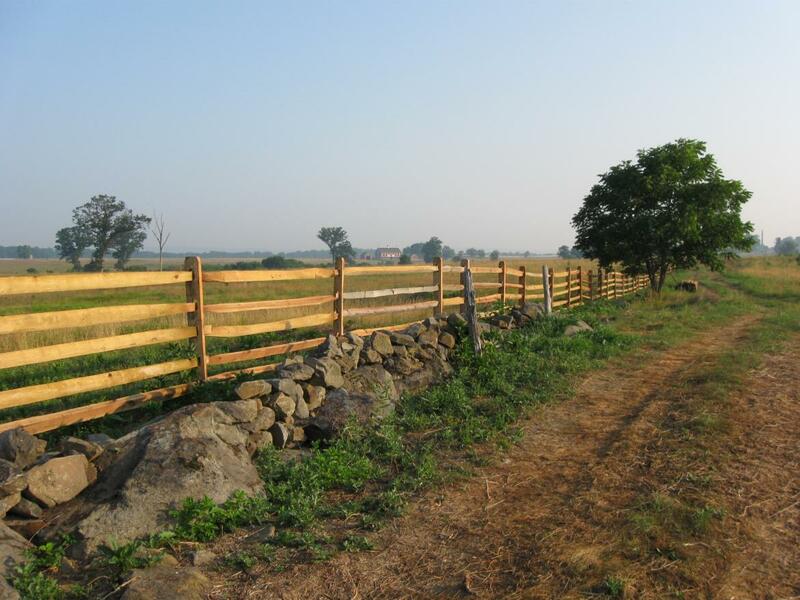 This re-fencing project was not yet complete on the day that we took these photographs … This view was taken facing north at approximately 6:40 AM on Tuesday, July 6, 2010. …On this day it stopped at this tree. The Trostle Barn is in the right background. Barksdale’s Mississippians and Wilcox’s Alabama Brigade moved towards this area from right to left or west to east late in the afternoon of July 2, 1863. This view was taken facing southwest at approximately 6:40 AM on Tuesday, July 6, 2010. …The fence will stretch to the area of the Vermont Monument, which is the tallest monument in the background, above the “left rut.” This view was taken facing north at approximately 6:40 AM on Tuesday, July 6, 2010.